Thank you to those who purchased our new Exploring Laminitis eBook/App using the discount code in our newsletter last week, and for all the wonderful feedback! We've since had a few emails from people who missed out as they didn't realize that the code had an expiry date. In response we are issuing another code: aotesep14 which is valid until September 9th. This excellent photographic e-book by Jenny Edwards and Paige Poss compares external, radiographic and internal dissection views of normal and chronically laminitic feet - there is so much that can be learned from this book, and anyone who trims or advises on trimming a laminitic horse should study these images. There's plenty of information on the website before you even get to the book - http://www.anatomy-of-the-equine.com/exploring-laminitis.html. See x-ray images of P3 superimposed on the external hoof capsule of a healthy and a chronically laminitic foot (interestingly the laminitic foot didn't have significant sinking). Note how the hoof capsules don't look that different from the outside (apart from the high heel/shallow hairline angle on the laminitic foot) despite significant dorsal rotation on the laminitic foot - the angle of the toe and heel are similar on both feet, suggesting that these angles are not suitable for assessing foot health/guiding the trim. There are fascinating explanations of changes in the coriums in the foot after laminitis (coriums contain blood and nerves and are where new cells grow). 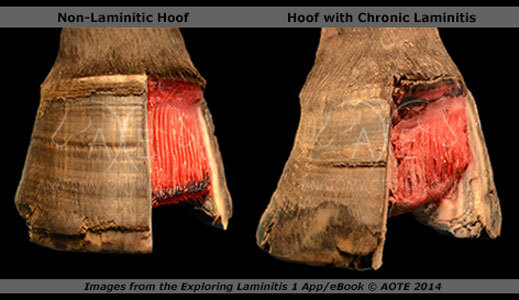 Photos of the toe of a healthy and laminitic foot with a section of the hoof wall removed show how the coronary corium has become flat and wide, the sensitive laminae disorganised, and the solar corium displaced on the laminitic foot. The laminitis has caused distinct changes to the coriums, which will distort hoof growth, and trimming to correct this and prevent further distortion is essential. A close up of a saggital section through the centre of the toe of both a healthy and laminitic foot (the same feet as the x-rays, which makes for very interesting comparisons) suggests the negative impact of the substantial laminar wedge (the laminar corium appears to be compressed, and does the wedge also impact on the coronary corium? ), and the need for corrective trimming to reduce/remove this distorting pressure without weakening the foot. Note the separation that appears as a gas pocket on the x-ray, the bloody area at the tip of P3 which presumably ties in with the slight ski tip on the x-ray, and how incredibly thin the sole is under the tip of P3 in the centre of the foot (the sole thickness doesn't look half as scary on the x-ray) - it makes me shudder to think of anyone going near a sole like that with a rasp - but I know it happens. More about the book later - I've already spent hours studying and playing with the images, have learned a huge amount (and got a load of questions!) but still have a lot more to discover. What is exciting is that Jenny and Paige promise that this is just the first book in a series that will highlight different types of laminitic hooves and the variations that can occur. 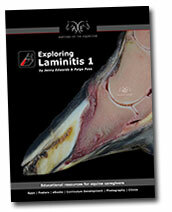 Exploring Laminitis 1 retails for $19.97 but for a limited time we are offering a $5 discount when you use the code: aotesep14 in the checkout (available for the eBook only). This code expires on 9th September so be sure to get your copy soon.